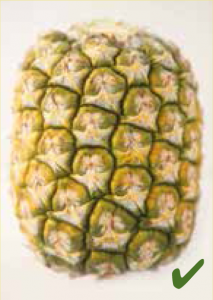 The colour of a pineapple’s skin can naturally vary between summer and winter, but they are always ready to eat as soon as they hit the stores. 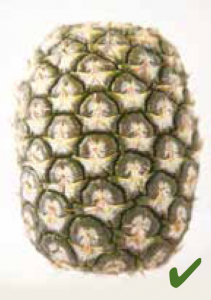 Some pineapples have crowns and some don’t, but all pineapples have the same sweet, juicy taste and are the same nutritionally. 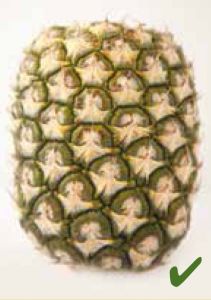 Growers actually cut off the tops of some pineapple varieties with the intention to re-plant for the next crop. Choose fruit that is free from soft spots or bruises, and if it has a top, make sure the leaves are fresh and green. A pineapple should feel nice and heavy for its size. Contrary to what many people think, pineapples don’t need to ripen at home, they are always ready to eat as soon as they hit stores, regardless of their colour.